Those who know the beautiful old ruined church of St. Bartholomew, which lies in a secluded corner of Arborfield Park, will be interested to hear that, although the Victorian memorial chapels adjacent to the ruin are to be pulled down very shortly, efforts are being made to strengthen and preserve the older remains. Only a few records of Arborfield’s history have come down to us through the mists of time. 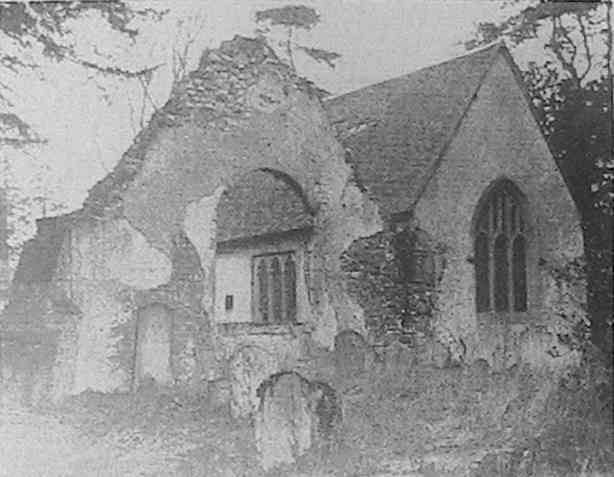 At one time the church was a chapel of Sonning, and in 1220 it is described as being built of wood and in a ruinous condition. A remarkable incident is recorded two years later when it was found that an old priest from Reading, said to be blind as well as infirm, who was serving the chapel, was found not to know a complete word of either the Gospel or the Canon of the Mass. Needless to say, he was forbidden to officiate. It must have been soon after this occurrence that the chapel now in ruins was built. This served the needs of the parish for nearly six hundred years until the middle of the last century, when, as it was rapidly becoming ruinous, it was decided to build the new church, also dedicated to St. Bartholomew, which now stands on a prominence some eight or nine hundred yards away. The work was completed in 1863, when the roof of the old church was removed. The bells and some monuments and other fittings were removed to the new church, and already the finest, a large marble tomb with life-sized marble figures of William Standen and Maria, his wife, who died in 1639, has found a resting place just within the main door of the new church, to which position it was removed earlier this year. An old door with original ironwork probably dating from the 14th century will also be preserved, and will be used when a new vestry is erected. All the other fittings are modern. The preservation of the ruins will include some excavation work and the pointing and cementing of the walls. Efforts will also be made to preserve some of the old wall paintings which decorate the splay of the main window. The removal of the ivy may disclose architectural features such as a sandstone piscina, three sedilla, an aumbry which have, hitherto, remained concealed. The work is being supervised by Mr. C. B. Willcocks, F.S.A., of Reading, who is well known for his efforts in saving old Berkshire buildings and local history recording. One of the main glories of the old church was the glass in the window above the altar, which represented Moses and Aaron holding the two tablets of the law. This glass was made by a celebrated local craftsman, John Rowell, who lived in the earlier part of the eighteenth century and died in 1756. He is supposed to have re-discovered the wonderful red which is a conspicuous feature of early mediaeval work, but the secret is supposed to have died with him. Unhappily, the window was broken in 1863, and only the upper portion of Aaron with a small fragment of the red glass in a corner of the robe is yet preserved in a window of the new church, where its vivid colours make a striking contrast to the subdued tones of the more modern windows. Here, too, is preserved the old wooden font, an almost unique feature, but some mediaeval patterned tiles have found their way to the Reading Museum, where one is at present displayed in the local room with others from nearby sites. Actually the removal of the modern chapels will, if anything, enhance the charm of the old ruin and its surroundings, and, no doubt, many interesting relics of the older building will be recovered when the work is taken in hand. With acknowledgements to Berkshire Media ('Reading Mercury'). Photo copyright Reading Mercury; used by permission.